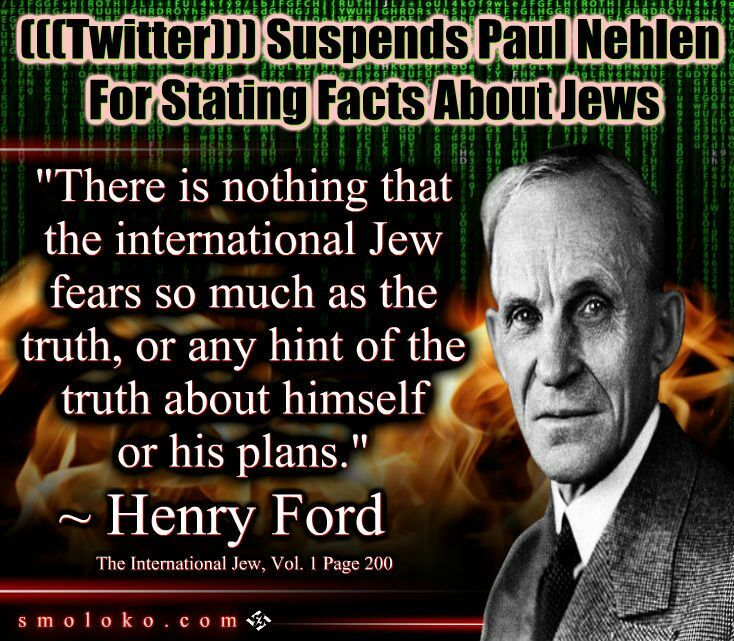 Paul Nehlen was suspended from Twitter for a week because he stated facts about Jews. He posted a statement about his suspension on his Gab account. Nehlen is the *second* GOP candidate for federal office to be suspended or banned from Twitter within two weeks. This targeting is a direct and substantial threat to the integrity of our electoral process, and justifies immediate congressional investigation and intervention. This is just another example showing the tyrannical nature of Twitter. It is a fact that Jews control large portions of the American media. Why can’t someone post simple observations about Jews controlling the media on Twitter? Apparently Twitter thinks facts about Jews are anti-Semitic and hateful and therefore can’t be said. The good news is that the flood gates are really starting to open on the Jewish problem. The Jews can’t just claim that it is only a small number of crazy people in KKK robes talking about this. We have serious people asking legitimate questions about the power that Jews have in our country. Jews represent two percent of America’s population yet they somehow have control over our most important institutions. It is not unreasonable to ask questions about this. A small minority population should not be dictating the direction of the country. This stream is certainly worth watching. We have someone willing to name the Jew and call out the fact that Whites are undergoing a genocide running for office against one of the biggest cucks in the country. His platform is strictly anti-immigration, anti-censorship and pro-White. He names the Jew as pushers of censorship online and states very clearly he will not sign any kind of document swearing he will support Israel. If you are in Wisconsin, vote for him. If you are not in Wisconsin, shill for him. If this guy wins it will be the start of our people and politics gaining real power in the world. This kind of a win will increase the morale for anyone else considering running on an explicitly pro-White platform in America. Even if he doesn’t win, if he gets a significant amount of support it will still send that message and it will force our talking points into mainstream discussions to a point which hasn’t been seen in decades. So true. I’m even seeing this on normie sites – something I never saw just a few years ago. The word is getting out – why Jews are always pushing for Hate Speech Laws (i.e., questioning any aspect of the Holohoax) – and I have no doubt if Hillary were president (shudder) this would have already been pushed through by now. More people are becoming Jew-aware daily and understanding the tyrannical hold they have over us – along with being the instigators of White Genocide and destruction of White homelands and Western Civilization. Keep spreading the word as much as possible as to what these evil monsters are doing to us – they wish us dead, believe we don’t have the right to exist. They are truly evil. 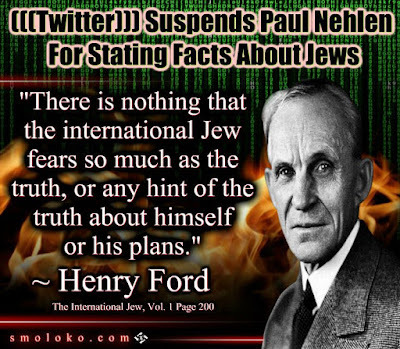 And, I would strongly suggest Mr. Nehlen had better start watching his back. Antisemitism is good, it’s the natural reaction of a body attacked by bacteria. It repulses it outside to protect itself. Antisemitism is caused by the Jews, all Jews including those who don’t harm us directly but stay silent. Antisemitism is the restoration of justice, Jews deserve it and non-Jews need it. Antisemitism is a solution to all our problems . Without recognizing the Jewish nature of our problems we can never solve them. Just like you ban anyone mentioning your nonsense belief in Maitreya. Talk about the pot calling the kettle black. The fact that Eric permitted this comment to stand is evidence that he is permitting people to discuss the advent of Anti Christ on the basis of the Bible and the teachings of saints instead of just pontificating his Maitreya theory. My own view is that in this era of Sardis he has been revealed. And the era of Sardis will end in the manner that our Lady foretold at Akita if the world does not convert. I think we will have to wait for the end of Laodicea in order to see his return as the Beast/8th king - indwelt by Lucifer coming in the clouds of heaven scenario. The description of Maitreya absolutely fits the the description of the antichrist.